LINCOLN PARK — Some of the only in-depth reporting on true conditions of the area surrounding Sochi's "Olympic bubble," went on display at the DePaul Art Museum this week. 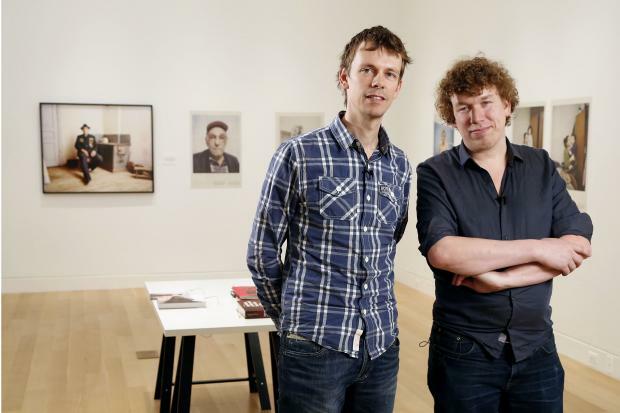 The Dutch creators behind "The Sochi Project," a photographer and writer who spent five years going door-to-door reporting in the region, have since been banned from returning to Russia. Photographer Rob Hornstra, 38, and writer Arnold van Bruggen, 34, said it's now impossible for outside journalists to do any reporting of substance in the region. "We knew if you want to make these stories about the region around Sochi you have to do it like we did it, far before the games," Hornstra said. "It will be very difficult to make different stories other than these beautiful glossy Olympic games and that's why we thought it's really necessary to do a project like this." One American journalist, David Satter, was expelled from Russia this week. Security measures have also gone up in the region following two recent suicide bombings. Hornstra and van Bruggen are set to give a talk about their work Friday night at the DePaul Art Museum, which is the first U.S. city to host their exhibit showcasing the photography and stories collected from 2009 through 2013. The two were already working to document the region when they heard the 2014 Winter Olympic games were awarded to Russia. Over the course of their reporting they were arrested multiple times, and eventually were denied visas to return in July 2013. "Every time we went up in the mountains in the caucus zone we were either arrested or sent away or brought before court one time," van Bruggen said. "In the end we got expelled more or less." The $50 billion winter games, which make them the most expensive in history, are set in a sub-tropical region full of conflict and human rights abuse, according to the Sochi Project creators. Hornstra and van Bruggen hope the exhibit will allow people to see a true portrait of where the games are being held. The actual city of Sochi is about 15 minutes north of the of arenas and athlete village. "It's a very strange region to organize the games in because you know for sure that you will get in trouble, for instance, security-wise," van Bruggen said. "There's a big chance terrorists will try to disturb these games." The duo traveled into the volatile northern Caucasus region for the project, claiming they were creators of a wrestling documentary in Chechnya. Four people who were interviewed in the Caucasus region have since been killed, likely by security forces, according van Bruggen and Hornstra, who read of the killings on Russian news sites. "These kinds of stories make you realize which region these games are being organized in," van Bruggen said. "It's a strange situation, but it's happening." While "The Sochi Project" exhibition at DePaul is the first in the United States, their work is also currently on display in Antwerp, Belgium. "The Sochi Project" was scheduled to be displayed in Moscow's Winzavod Centre for Contemporary Art in October, but Russian authorities refused to grant visas to Hornstra and van Bruggen and the show was canceled. Once Russian and Dutch media picked up on the snub, it became a national scandal in both countries. The cancelation of the Russian exhibit gave the project plenty of publicity, but in the end it could mean the two will never be able to revisit Sochi after the games to document the long-term effects of the games in the region. "Absolutely I want to go back there and see what happens with the beautiful glossy games," Hornstra said. "I'm very curious." The exhibition at the DePaul Art Museum combines documentary storytelling and photography through various formats including photographs, videos, text and numerous books published through the project. The museum even plans to host a Sochi Singers Karaoke Party on Feb. 28 to celebrate the city's rich karaoke tradition. Other events celebrating the games and exhibit include a discussion on the politics of the games by DePaul political science professor Richard Farkas on Feb. 12. "If people here in Chicago only want to see sport and do not care what is happening in the rest of the world, perfect, you don't have to do it, but I believe everywhere, also in Chicago, there are many people living who are interested to see a little bit more than the games," Hornstra said. "They want this perspective of what's happening over there and if you want this perspective you should come to this exhibit."